Why do people dig Ben & Jerry’s ice cream? It is because it is delicious! They also have really great flavor options. Vanilla ice cream is good… but sometimes you want some Chubby Hubby®. If you are a fan of flavor (and dirtbikes! 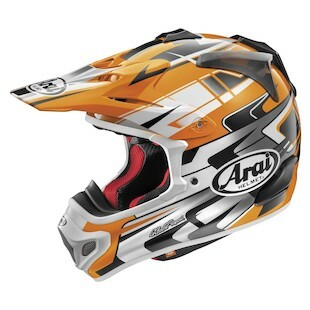 ), Arai has the helmet graphics for you. With the new VX Pro 4 helmet, you will get one of the very best off-road lids available with a vast array of clutch upgrades over the VX Pro 3. To spice things up a bit, however, you can take a look at the jagged, hectic, energy-filled graphic of the Arai VX Pro 4 Tip Helmet. With a wide variety of color options (we obviously favor the Orange!) and a chiseling pattern that looks as if it were pulled from a chainsaw of awesomeness, there is no missing this vibrant option. 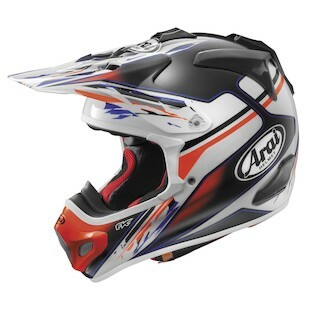 If something a little less chaotic is your style, the Arai VX Pro 4 Nutech Helmet offers a more subdued graphical option with relaxed flow. With a Red/White/Black color scheme and made to look as if the paint has been smudged from usage, this lid stands out in a crowd without screaming its own name. To put it in ice cream terms, it is more of the Vanilla Caramel Fudge than the Karamel Sutra®… a new twist without a revolution. In the end it all depends on what you like. If you are a rider who wants the best that the motorcycling world has to offer, yet with a little extra character injected into it, then you should check out the VX Pro 4 Tip and Nuetech helmets. Now lets to eat some ice cream!